A group of teachers and school staff on Staten Island plan to wear this T-shirt in support of the NYPD on the first week of class, after their union publicly supported a march for Eric Garner. STATEN ISLAND — Hundreds of teachers and school staff across the borough plan to show up to the first week of school wearing T-shirts that express support for the NYPD — in a show of protest against their union's backing of last month's march for Eric Garner. 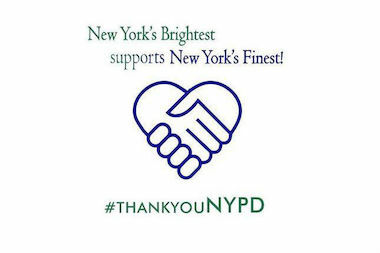 Nearly 550 T-shirts reading, "New York's Brightest Supports New York's Finest, #ThankYouNYPD," have been purchased from printing company Special Tees in anticipation of the first week of school, according to company director Vincent Bonomi. Garner, a 43-year-old asthmatic, died July 17 after being placed in an apparent chokehold during an arrest for selling untaxed cigarettes. The Rev. Al Sharpton led a march Aug. 23 in honor of the Staten Island father of six. "It started out as just a couple of teachers from a school who came in and ordered shirts, and word of mouth has spread, and we've been getting calls ever since," said Bonomi, whose company charges $6 for the shirt. "There are a lot of schools on Staten Island that are ordering them — from the South Shore to the North Shore and everywhere in the middle." The company is one of several that are listed as supplying pro-NYPD T-shirts for teachers included on the "UFT Members for the NYPD" Facebook page. The online group, which currently lists 135 members, was founded by a collection of Staten Island teachers and paraprofessionals angered by United Federations of Teachers boss Michael Mulgrew's support for Sharpton's march for Garner in St. George. Members accused the UFT of rushing to judgment against the police officers involved in Garner's death, which was ruled by the city's medical examiner's office as a homicide by chokehold, before the case has had the chance to go before a judge. Donna Romani, a paraprofessional at an elementary school, said she heard of many teachers' desire to wear pro-NYPD shirts to school this week and decided to print a shirt for people who don't already have police-themed tees. "We're just wearing the shirts to show our support for the NYPD," Romani said. "We were against the unions marching without asking the members." The UFT did not respond to requests for comment. Sharpton has said previously that he and those who participated in the march weren't against all police officers, just a couple of "rotten apples." “Most police do their jobs, but those that break the law must be held accountable,” Sharpton said. Romani said the majority of union members she knows were against the march, as demonstrated by another Staten Island UFT member who got more than 1,600 signatures after starting a petition calling on Mulgrew to resign. Romani said that teachers and staff from all over the borough plan on wearing the shirts on either the first day or first week of school. Her school, which she didn't want to name, will be wearing them on Friday, she said. "We don't want to take away from the kids starting" on their first day, she said. "[Mulgrew] should have consulted his rank-and-file members before saying the UFT is participating in it," Romani added. "He wants his members of his UFT to be fairly treated and all facts to be looked at, so be it for the police department."